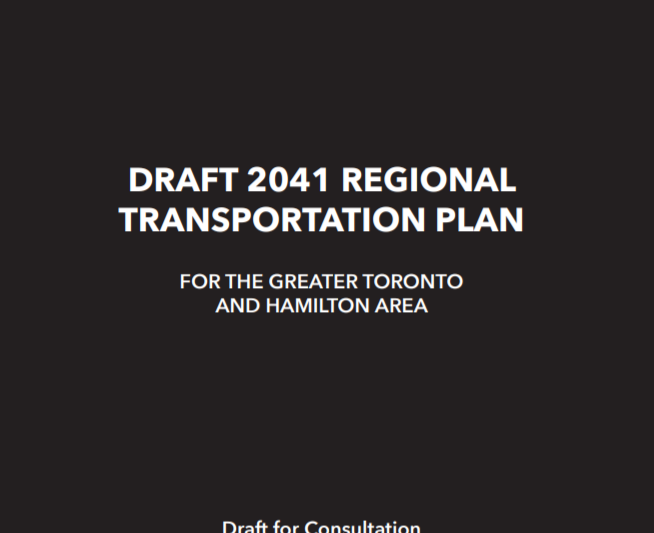 On November 15, 2017 TCAT Director Nancy Smith Lea and Dr. Raktim Mitra from Ryerson University made a joint response regarding the Draft 2014 Regional Transportation Plan for the Greater Toronto and Hamilton Area, released by Metrolinx in September 2017. These comments build on our previous response submitted in November 2016. You can read our full comments here. Overall, we are pleased to see some of our recommendations from 2016 reflected. The 2041 Draft RTP includes critical policy directives to adopt a Complete Streets approach when new transit projects are undertaken, the development of a Regional Cycling Network, and the elimination of traffic fatalities and serious injuries as part of a regional Vision Zero framework. The Plan also provides incentives to increase walking and cycling to transit, and provides a strong focus on designing for the first- and last-mile. We are also pleased to see mode share targets for increased active travel, although we feel that more aggressive active transportation mode share targets are achievable. Similarly, we were pleased to see action regarding removing subsidies from free car parking, but noted the lack of a concrete plan for offering discounted GO ticket prices for people arriving by bike or on foot. We also noted other missed opportunities within the 2041 Draft RTP. Specifically, we noted the lack of priority actions related to active transportation in the expansion of the Frequent Rapid Transit Network, and the lack of active transportation in the re-invention of the Transportation Demand Management strategy. In addition, the exclusion of active transportation from new task forces to “coordinate the planning and operations of transit, roads and on-street parking” is a missed opportunity. Lastly, the Plan does not identify any strategies to develop a regional walking plan, and does not clearly articulate a funding strategy to implement the proposed Regional Cycling Network. The consultation period for the Draft 2041 RTP will be open until November 17th. Email theplan@metrolinx.com or respond to a short survey (at bottom of page).